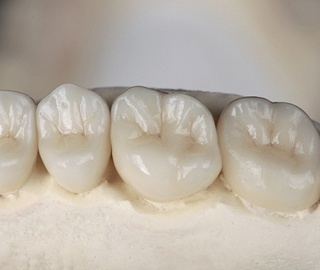 Dental crowns have been a staple of restorative dentistry for decades. These strong and durable restorations completely encapsulate a tooth in order to restore both form and function. And today, crowns are typically made of all-ceramic materials, so they look better than ones that were previously made of metal or porcelain fused to metal. Also commonly referred to as a “cap,” a dental crown helps protect teeth that have been weakened due to damage or decay. For instance, a tooth may have a crack that threatens to split the tooth. This does not necessarily mean that the tooth is not salvageable. To the contrary, with a properly fitted crown from Dr. Olsen, your tooth can continue to give you many years of service and smiles. Patients appreciate the valuable durability and aesthetic value this treatment offers, especially when you want to improve the cosmetic appearance of dark or unsightly teeth. At our office, dental crowns usually require two visits. At the first, we carefully and precisely prepare the affected tooth. This necessitates reducing the size of the natural tooth structure. Dr. Olsen removes enamel along the sides and on the chewing surface to ensure that the crown fits comfortably. If the size of your tooth is not sufficiently reduced, then the crown will be uncomfortable and will likely interfere with your bite and your ability to chew normally. At this appointment, we also make a mold of the tooth and provide you with a temporary crown. This mold will be sent to our professional dental lab where a skilled ceramist will carefully and precisely create your permanent crown. At the next appointment, we’ll place your brand-new, personalized permanent crown. Dr. Olsen will first check to make sure that it fits properly. If minor adjustments are necessary, those can easily be made in our office. Then, your dental crown will be cemented over your prepared tooth. You’ll be able to leave our office with a revitalized smile that both looks and feels healthier! To care for your new dental crown, all you need to do is give it the same care you do your other teeth. Brush and floss daily, and be sure to pay particular attention to the area where the crown meets the gum line, because plaque is more likely to accumulate there. Dr. Olsen and his team work hard to provide patients with comprehensive dental care that’s always comfortable, convenient, and skilled. Contact our Ann Arbor office today if you have any questions about our available services, or if you’re ready to schedule a consultation. We will be happy to meet with you to discuss all of your dental needs. Dental crowns are just one of the ways we can restore your healthy and beautiful smile. Dr. Olsen and his staff also offer many more cosmetic and restorative dentistry services, ranging from teeth whitening and porcelain veneers to bridges and dentures. We look forward to seeing you!